The thyroid is a small butterfly-shaped gland which plays an important role in your well-being and health. So how come we know so little about it? Your thyroid lies in the front of your neck, just below ‘Adam’s apple’ (this is the lump or protrusion that is formed by the angle of the thyroid cartilage surrounding the larynx which is also called the ‘voice box’). The thyroid makes the hormones to makes sure the body’s metabolism, temperature, vitality and development are in order. Women are affected by thyroid disorders more often than men, and some statistics show that 1 in 8 women will suffer from a problem related to this endocrine gland at some point in their life. 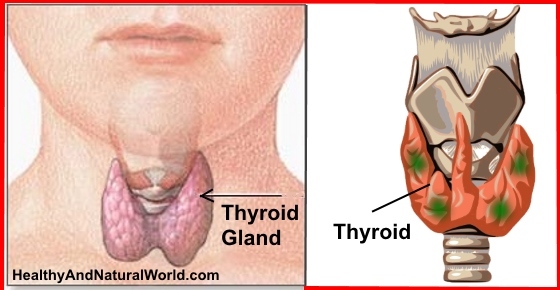 The thyroid gland takes iodine from the food and converts it into thyroid hormones (T3 and T4). Hence, in geographic areas where iodine supply is scarce (and is not supplemented), we can often see more people with thyroid problems. Iodized table salt is usually a good source of iodine. The brain’s pituitary gland controls the activity of your thyroid gland by secreting TSH (thyroid stimulating hormone). This is the hormone that stimulates the thyroid to produce thyroid hormones T4 (thyroxine) and T3 (triiodothyronine). Doctors diagnose hyperthyroidism by testing if TSH levels are normal, high or low and in combination with T3 and T4 levels. Other types of tyroiditis include silent or painless thyroiditis and subacute thyroiditis. They both have similar presentation to postpartum thyroiditis, but are not connected with giving birth. Providing very good health knowledge,Thanks,All the Best. I’m suffering hyper thyroid. I found this page very informative! I would like to know more about this ! Thanks. THANKYOU for providing such great easy to understand info, info even medical papers are complicated to grasp! You are simply wonderful. You educate us a lot on health issues and we can’t just thank you enough. I also need detailed information on how to totally reclaim my hair back off baldness. Thanks. Hi Paul, there are several methods that encourage hair growth, but they are not suitable for completely bald people. They are suitable for people who have thinning hair. You can read more about these methods here: 1. Castor oil 2. Onion juice 3. Rosemary. I am suffering from hypo but the syptoms which is mentioned here match to me as a hyper then there is some confuaion in my mind. Which is correct one?? Please clear my all queries. I think you might be interested to read my article about Top 13 Signs That You May Have a Thyroid Disorder which talks more about hypo vs. hyper. For an accurate diagnosis you will need to refer to your doctor (as I’m not a doctor).